Local dive site at Khao Lak | 2 Dives daytrip to Boonsung wreck. If you are looking for a short diving trip to enrich your holiday at Khao Lak without taking too much of your time, the daytrip to Boonsung Wreck might be something for you. Wreck diving is one of the most exciting parts of diving – an old ship wreck, somewhere out in the open sea, which sank for some mysterious reasons. . . Let’s explore it! The area around Khao Lak is rich of tin and till the 80’s, tin mining was big in this area. You can get an impression of the life of that time in the movie The Tin mine. Set in the 50’s, it tells the story of a young man working on a tin dredge in Takuapa. Boonsung Wreck lays about 7 nautical miles off the coast of Khao Lak, positioned in a north to south direction on serene flat sand at 18 to 20 meters, with the decks in about 12 meters depth. It is also called the Bangsak Wreck, named after the village of Bangsak, that’s located at this part of the coast. The wreck itself is about 60 meters long, 12 meters wide and about 6 meters high. It is an old tin mining boat that was owned by the Boonsung Tin Mining Company and operated up and down the Andaman coast throughout the tin mining boom, starting in the 1950’s. The boat sank in 1984 after somebody flushed the toilet and the water started rushing in and did not stop (that’s how the legend goes). . . another (less exciting) story says that it sank in rough seas. At first, due to its large size, the Boonsung wreck lay close to the surface, making it a safety hazard to local fishing vessels. So the Thai Navy was called in to bomb the boat, reducing its height by collapsing the decks, creating the wreck that we used to dive until the tsunami hit the west coast of Thailand in 2004, which broke the Boonsung wreck into 5 pieces. The scattered parts enlarge the dive site, making up the site we dive today. The wreck itself is fully covered with barnacles, soft corals and sponges. 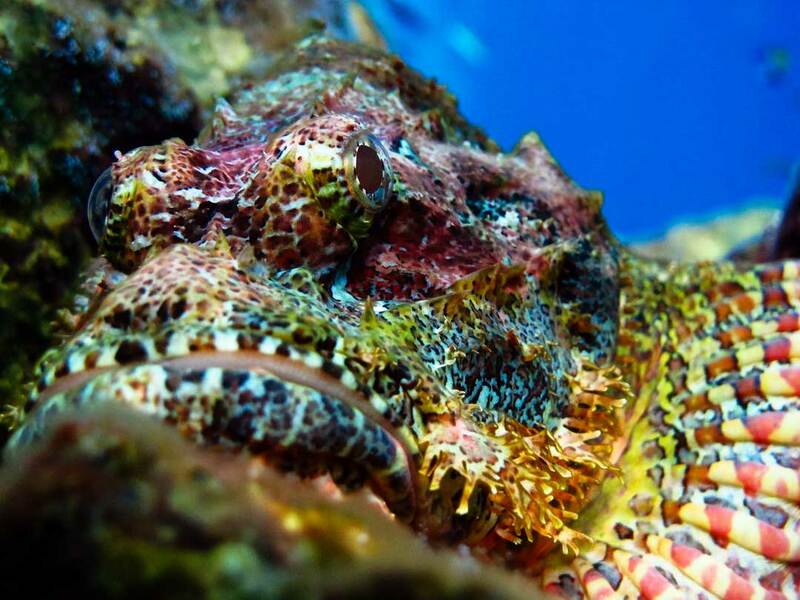 Nudibranches, spotted morays, white eyed morays, zebra and honeycomb morays, banded boxer shrimps, stonefish, ornate ghost pipefish and scorpion fish find their house on the deck. 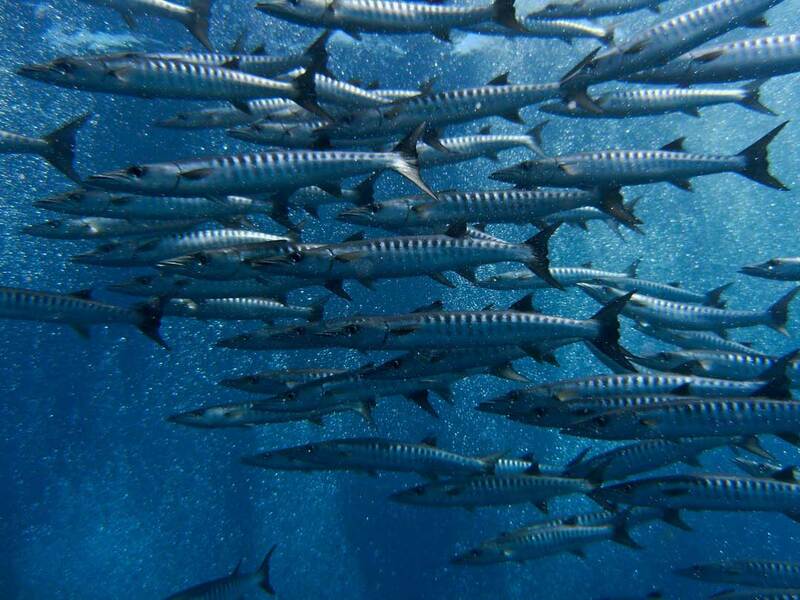 Tons of fish gather around here, such as giant schools of barracuda, batfish, trevallies, porcupine fish and snappers. The density of fish sometimes makes it difficult to spot the wreck whilst descending or keep sight of your guide and buddies! On the sandy floor you can sometimes see leopard sharks and tiny flounders, crocodile fish and stingrays wedged in the sand. During the whale shark season (February, March) there is a good change to encounter a whale shark here too. Also keep your eyes open for the many lionfish found hovering around the entire site. 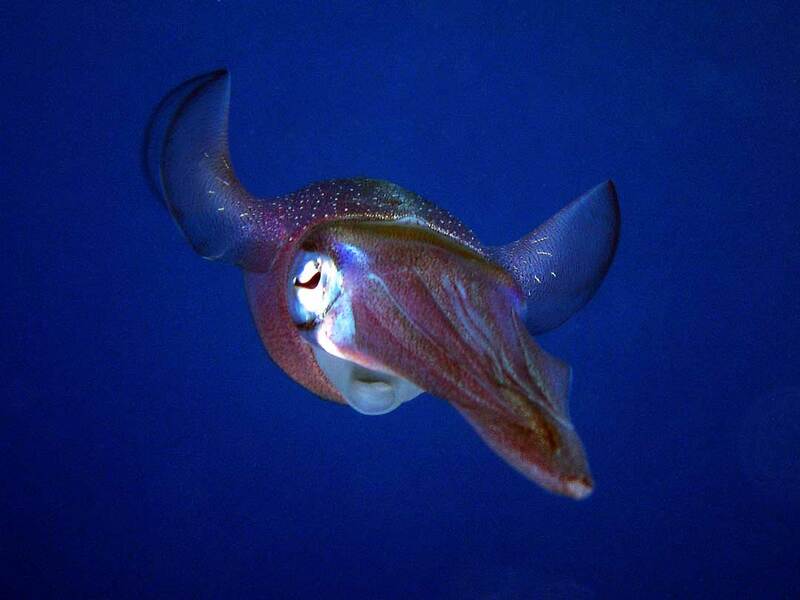 They are well known for their ornate beauty, venomous ray fins and unique tentacles to attract their prey, mostly crab, shrimp and small fish like glassfish. They blow jets of water while approaching their prey, apparently to disorient them. The lionfish then spreads its large pectoral fins and swallows its prey in a single motion. Let’s say they always have the right of way. The dive site is very popular amongst all underwater photographers but it’s perfect for macro photography! Caution: Avoid penetrating the wreck at all costs! Since the tsunami broke it apart, the separate structures are very unstable! 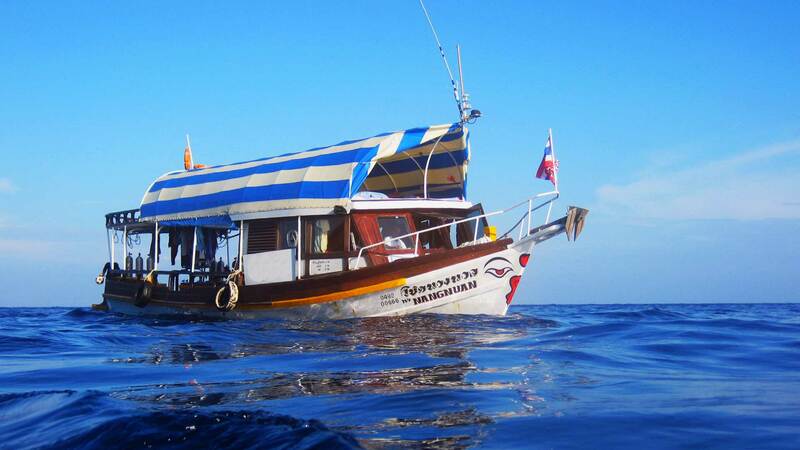 This dive trip is done on M/V Nangnuan, a comfortable classic wooden boat with toilet, shower and relax area, It is equipped with the latest navigation and electronic boat handling devices and also has a medical first aid station completed with oxygen supply. The elegant boat provides a more intimate diving experience, since the maximum number of guests is 12 people. The diving groups have only 4 divers per dive guide and you will dive two times at the wreck for 45 to 60 minutes. Pick up from your accommodation in Khao Lak by taxi. At 8.45 AM M/V Nangnuan leaves from Pakarang Cape. Travel time is around 30 minutes. Dive groups are based on certification level and dive experience. In this way everybody will feel comfortable: from the novice open water diver to the more experienced diver. Each Dive Master gives a detailed dive briefing to his group and helps with setting up your diving gear. Ratio divers: 4 divers to 1 Dive Master. Plunge into the clear water and enjoy the incredible marine wildlife of Boonsung wreck or TOR 13 wreck. Back onboard, a Thai lunch will be served. After a 1 hour surface interval, the Dive Master will give a detailed briefing for the next dive and help you with gearing up. Plunge back into the water and get the experiences of tropical wreck diving. After the dive the longtail boat will return back to the harbor. This is the time to fill in your logbook and exchange experiences. Arriving back at Cape Pakarang around 15.00 PM, the taxi is waiting to bring you back to your accommodation in Khao Lak. Schedule can be changed due weather, sea conditions.